AIMS : International Amusement Supplier Association. BOVAK : Dutch Showmen Guild member of the European Showmen Union. BSM : German Guild of Showmen and Market-merchants. DEUTSCHER SCHAUSTELLERBUND e.V. : German Showmen Guild member of the European Showmen Union. ESU-UFE : European Showman Union. IAAPA : International Association of Amusements Parcs and Attractions. Stichting Rijdende School : Dutch mobile school on behalf of the schooling of the showmen and circusemployees children in the Netherlands. TILBURG Last 2 weekends of July 2014 : The biggest Town fair in the Netherlands about 200 attractions. DROUWENERZAND ATTRACTIEPARK : Gasselterstraat 7, DROUWEN. BREAN LEISURE PARK - FUN CITY BREAN : Strandroad, BREAN Somerset. KMG BV : Organizer of all kinds of festivities, letting out all kinds of equipment. KMG EUROPE : Qualified builders of easy building fair attractions. ALL THE FUN OF THE FAIR : Website for U.K. travelling showmen and Fun Fair Fans. FAGB : The Fairground Association of Great Britain was founded in 1978, and is now the UK's leading club for funfair enthusiasts, with members as far afield as Australia and North America. FUNFAIRWORLD : Website for U.K. travelling showmen & fun fairs. DINGLES FAIRGROUND HERITAGE CENTRE : Museum in Great-Britain of vintage fairground attractions and other vinmtage fairground objects. 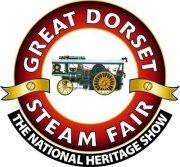 GREAT DORSET STEAM FAIR : Wednesday 27h August until and included Sunday 31st August 2014. 43rd Great Dorset Steamfair. SOUTHDOWN - TARRANT HINTON - BLANDFORD - Dorset. All information: Show Office Dairy House Farm - Child Okeford - BLANDFORD - Dorset DT11 8HT Tel +44 (0)1258 - 860361. SCARBOROUGH FAIR COLLECTION : Museum of vintage fairground attractions, organs, steam vehicles and so on in Great Britain. DEAN ORGANS : U.K. Manufacturer of organs. KRING VAN DRAAIORGELVRIENDEN : Dutch website of fair and street organs. NAARSO : USA National Association of Amusement Ride Safety Officials.